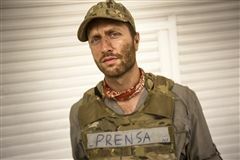 List of 70 news stories. Last Friday parents of students in all divisions gathered for coffee and conversation in the Carver Commons. 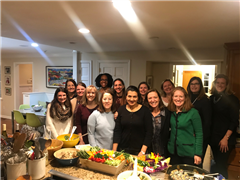 This casual social event offered parents the opportunity to connect and catch up with friends, both old and new. The Parents’ Association hopes that you’ll join in future PA Coffees so please stay tuned! Fifth grade science students were treated to a guest speaker today. Resident skeletal and muscular expert, NCCS Athletic Trainer Melissa Ryan-Knowlton, spoke to the students about common injuries experienced by different athletes such as sled hockey players (ice hockey for people with disabilities) and sprinters. With the assistance of an app, students were then able to identify various major muscles and bones. All part of their study of the human skeletal system. On Wednesday, March 6 we hosted a KAM Day informational fair in the Carver Commons. All thirteen of the KAM Day partner organizations were represented. 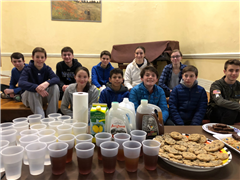 Every winter, New Canaan Country School students in pre-kindergarten through ninth grade collect maple sap and boil it down to syrup in the school’s Sugar Shack. The students tap the maple trees all over the school’s 75-acre campus, collect the sap, boil it down, then sample it. 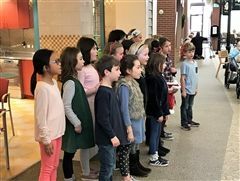 First graders have been studying China throughout the year, so they were brimming with excitement last Friday at a special Lunar New Year Assembly, complete with a traditional dragon parade, handmade noisemakers, and the banging of a gong, to celebrate the arrival of the Year of the Pig. View photos. 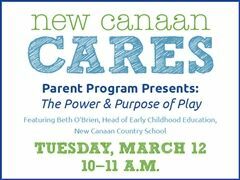 “The Power and Purpose of Play,” a New Canaan CARES parent program featuring Beth O’Brien, Head of Early Childhood of New Canaan Country School, will be held at 10 a.m. on March 12 at the New Canaan Library’s Lamb Room. 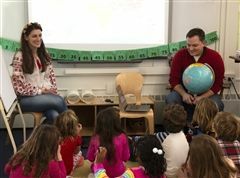 Last Friday, Tatyana and Eral Gokgol-Kline visited Mrs. Balasuriya’s first grade classroom to teach students about their native countries of Ukraine and Turkey. Their son, Kai, helped teach his classmates to count in Turkish, Russian and Ukranian as well. 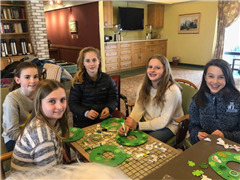 New Canaan Country School third and fourth grade students brought holiday cheer to the residents at The Village at Waveny, an assisted living facility in New Canaan, Wed., Dec. 12. 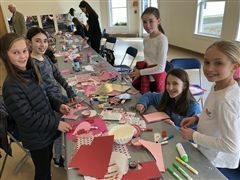 Lower School students continued to explore the idea of a “giving heart” by participating in two, donation service projects this December: a toy and gift drive for ELM/Camp Amerikids and a warm, comfort food drive for the Person-to-Person Mobile Food Truck. 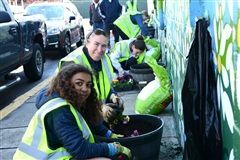 I wanted to share our latest Lower School community project with you, as we will be carrying it out in these weeks before break. If you have been to LS assembly, you have likely noticed that we always open our gathering with important messaging of community. 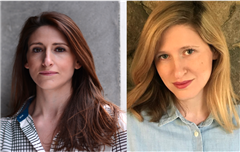 We talk overtly about what it means to be kind, how we can practice gratitude, and what it means to be our best selves. Six Country School 9th graders traveled to Nashville for the annual Student Diversity Leadership (SDLC) conference Nov. 28-Dec. 1. This year marks the 25th anniversary of this multi-racial, multicultural student gathering which focuses on self-reflection and building community. 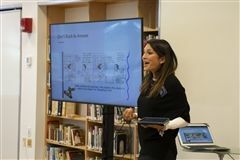 School Psychologist Rebecca Comizio shared strategies for parents at the Fall Early Childhood and Lower School Parenting Forum, The Art and Science of Communication: How to Nurture Effective Communication with our Children. 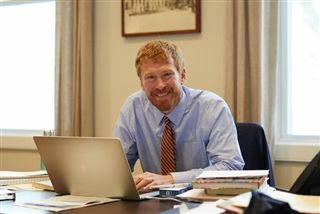 Head of Early Childhood. 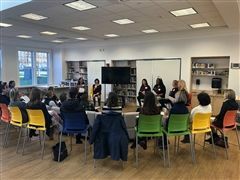 Beth O’Brien opened the forum with the quote: “The way we talk to our children becomes their inner voice” by Peggy O’Mara, and then Mrs. Comizio guided a discussion based on the book, How to Talk so Kids Will Listen & Listen so Kids will Talk by Adele Faber and Elaine Mazlish. View slides. The results are in! 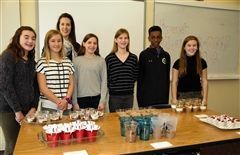 The winners of the 2018 French Mousse-Off are seventh grader Tanvi Debnath of Stamford, eighth grader Maeve Baker of New Canaan and ninth grader Alex Almeida, also of New Canaan. Scoring for the annual culinary contest is based on taste and execution as well as overall presentation of the delicious dessert often associated with haute cuisine. 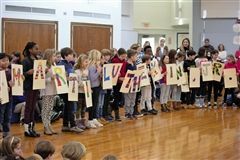 The Country School community, including students, faculty and staff from Early Childhood through Grade 9, collected 2,369 pounds of canned and dry food over the past two weeks in support of The Food Bank of Lower Fairfield County. 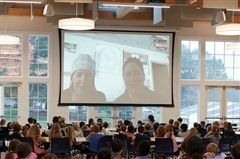 Earlier this fall former apprentice and assistant science teacher Hannah James teleconferenced with the entire Lower School from her current base at Summit Station (atop a 2-mile deep ice sheet!). 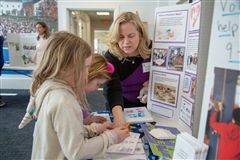 The Lower School community gathered in the new Susan Haigh Carver ’51 Dining Hall and Commons to hear about her work as a research scientist and life in the Arctic. If there is one word to describe the John Christophe Schlesinger ’89 Library since it reopened this fall, it is versatile. 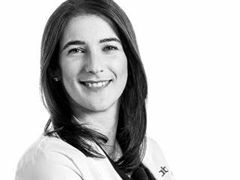 With the addition of the new Amicus Foundation Innovation Space, it has been a hub of inspiration and collaboration combining the best of traditional and cutting-edge resources. 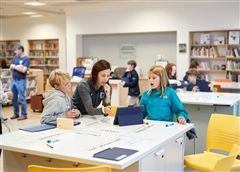 The space was designed to offer flexibility with moveable furniture, write-on tables, and a variety of seating (or standing) options, in addition to shelves stocked with books and robotics kits. 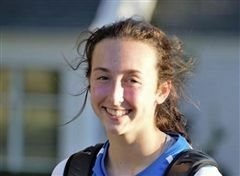 New Canaan Country School varsity soccer player Ava Gizzie attributes much of her success to a surprisingly non-athletic personal skill: time management. Members of the Country School community raised red, yellow and white lanterns at the annual Light the Night Walk on Oct. 28. 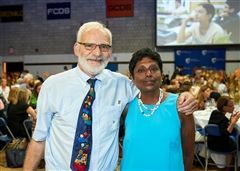 More than 60 students, faculty, staff and alumni attended the event and raised $5,300 (surpassing their goal of $5,000!) for the Leukemia & Lymphoma Society. Middle and Upper School students met Jordan Plotner, a British/American award-winning composer and producer based in Los Angeles during the Community Time assembly on Monday, Oct. 22. Fourth graders learned about the lives of Native Americans at The Institute for American Indian Studies. Middle School participated in their first round of “Clubs” last Friday, Oct. 19. Fifth and sixth grade students meet once every cycle (day 6) to participate in activities they have chosen. 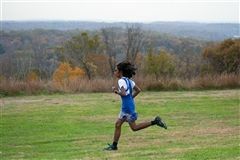 On Saturday, Sept. 28 the Country School community gathered for the Cougar Run on a beautiful, sunny fall morning. More than 120 registered runners completed the 5K on campus run and young children participated in an obstacle course and a Chase the Cougar Fun Run. 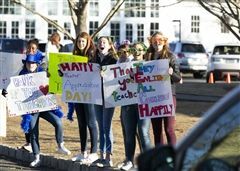 Attendees showed their school spirit and purchased logo wear. Our very own NCCS Cross Country team helped design the course and led the way for the runners as did Head of School Aaron Cooper. VIEW PHOTOS. Four large murals painted by the 8th and 9th grade Painting Elective and grades 1, 2, and 3 were recently hung in the Dining Hall. They depict a variety of food – fruit, vegetables and grains in vibrant colors. 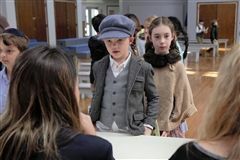 Inspired by their reading of Roxaboxen, an award-winning children’s book written by Alice McLerran and illustrated by Barbara Cooney, Country School second graders headed to the woods last week to build their own imaginary town. The annual trip to Camp Dudley provided this year’s 8th grade class with time to unify, connect with teachers and classmates outside the classroom, and display fortitude, resilience, leadership, and teamwork through a variety of outdoor activities. On the Outdoor Action Trip (O.A.T. ), Country School's 9th grade students broke up into four groups and spent three days hiking and camping on the Appalachian Trail in northwestern CT and southwestern MA. 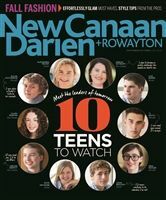 NCCS Alumni Named "Teens to Watch"
Congratulations to Alexandra Truwit '15 and Cam Raker '16 for being named "Teens to Watch" by New Canaan, Darien & Rowayton Magazine. Read more. 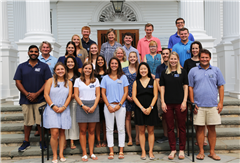 New Canaan Country School welcomes several new faculty and staff members this year. In addition, 16 new apprentice teachers have joined the community. 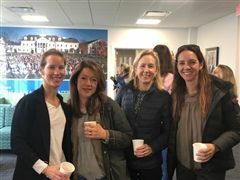 “We have attracted a very talented group of educators with an impressive array of professional experiences who are passionate about children’s growth and development,” said Head of School Aaron Cooper, who also joined the school in July. View the announcement. 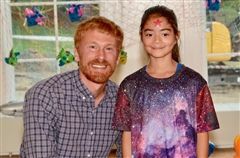 New Canaan Country School has named Samantha Flores as the 2018-2019 Horizons Scholar. 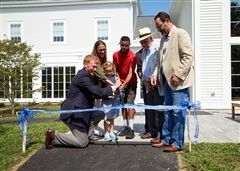 She will attend New Canaan Country School this fall as a fourth grader and has been a participant in the Horizons Program at New Canaan Country School for several years. 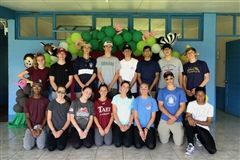 A day after graduation, 16 recent ninth grade graduates boarded a plane for a weeklong trip to Costa Rica to immerse themselves in Central American culture and Spanish language. 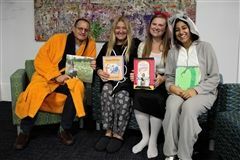 Inspired by the children’s book by Linda Kranz, the Horizons summer program theme is Only One You. 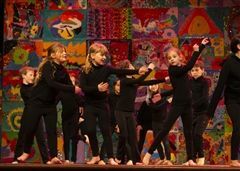 Two-hundred and sixty-three students, primarily from Norwalk and Stamford, are celebrating their individuality through art, academics and personal stories. 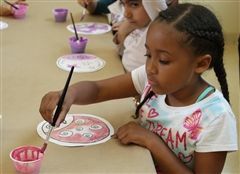 Now in its 54th year, the Horizons program’s curriculum is designed to reverse the “summer slide” in students’ academic progress, as well as instill confidence, resilience and optimism through our supportive community. 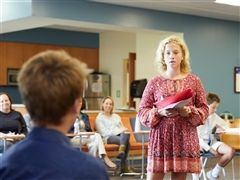 Thirty high school seniors from five towns were honored during the Horizons at New Canaan Country School graduation ceremony on Wednesday, June 6. In addition, 26 alumni were inducted into a new Horizons Alumni Association. 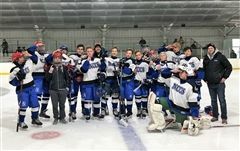 “We all know sports are important because they teach you teamwork, respect, determination, resilience, work ethic and the importance of being a part of something bigger than yourself, but I think one of the most underrated aspects of sports is to just have fun,” said New Canaan Country School ninth grader Alex Byrne of Darien during remarks he made at the end-of-term Upper School sports assembly, held on campus May 31. 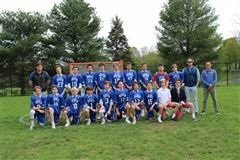 New Canaan Country School boys’ varsity lacrosse delivered their second, consecutive, undefeated season, with a 12- 0 final record. The team, consisting of Upper School students (grades 7, 8 and 9), netted 116 goals versus just 39 allowed. Students, faculty and staff gathered for the annual All-School Memorial Day Assembly on May 25 to honor those who have served our country. 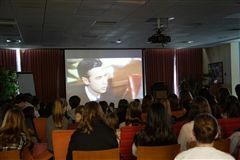 It was also an opportunity for students to offer thanks and a fond farewell to Head of School Robert Macrae. 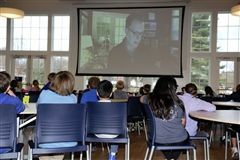 On Tuesday, May 15 over 150 guests entered the New Canaan Country School auditorium to the smell of movie theater popcorn and the soundtrack from Levinson’s The Natural playing. The crowd assembled to support Horizons and hear stories from two legends and current NCCS grandparents: Academy Award winner, Barry Levinson and Emmy Award winner, Bob Schieffer. 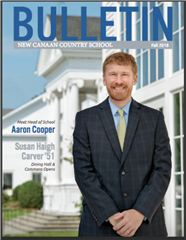 The Bulletin: Published twice a year for the larger school community, including alumni and parents of alumni and grandparents. To submit class notes, please email alumni@countryschool.net.